Check out this uniquely styled floor lamp, which also doubles as a table. One-of-a kind! This gorgeous lamp won't take up any extra space because it comes with its own attached round table! It's the perfect addition to any room in the house! Handcrafted in all Hickory! 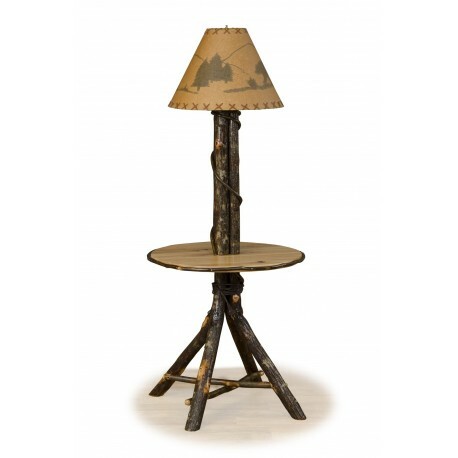 The perfect rustic accent floor lamp for any space - a bedroom, living room, lounge, or office. All hickory stick body and table. Bring the natural beauty of solid hickory logs to your home. Each piece is custom made in the USA by skilled Amish craftsmen. A great decor style for a rustic log cabin, mountain lodge, or country house. In-Home Delivery & Set-Up: Please see In-Home Delivery & Set Up for more information!